The Irish rebound from their putrid performance last Wednesday to pick up their first non-BC win of ACC play...nice. The Notre Dame Fighting Irish men’s basketball team managed to win another ACC game this evening, defeating the Georgia Tech Yellow Jackets 69 to 59 at Purcell Pavilion. The Irish were led by T.J. Gibbs’ 20 points, 5 assists, and 4 steals, as the junior captain looked much more confident and comfortable and happy than he had been during the past few weeks, where he’d struggled mightily to hit shots. He scored all but 2 of his points in the 2nd half. ND also got solid contributions from D.J. Harvey (16 points, 8 rebounds) and John Mooney (11 points, 14 rebounds), and Prentiss Hubb kicked in 13 points and 5 rebounds. The Irish shot 33% from the field and 22% from three point range (6-of-27), continuing their season-long struggle to efficiently make shots. However, the Irish won the boards in this one, out-rebounding Georgia Tech 45 to 39 and grabbing 20 offensive rebounds, leading to a lot of second-chances to score. Georgia Tech, meanwhile, was led by Michael Devoe, who scored 18 points and had 8 rebounds and 6 assists. Abdoulaye Gueye (12 points) and Kristian Sjolund (8 points) chipped in as well, and James Banks III added 9 points and 12 rebounds, scoring a few buckets in garbage time. The Yellow Jackets shot 41% from the field and 30% from three point range (7-of-23) and committed 6 more turnovers than ND, coughing it up 14 times overall. The first half was an ugly affair, as Notre Dame fell behind 17-8 while missing just about every shot they took for nearly 10 minutes of play (they finished the half shooting 29% from the field and 19% from long range). However, the Irish put it together and went on a 16-8 run down the stretch, driven by a nice spark off the bench from Nate Laszewski and some much-needed made shots by Prentiss Hubb, T.J. Gibbs, D.J. Harvey, and John Mooney. In the second half, the Irish used a 9-0 run early to take a 5-point lead, but Georgia Tech soon evened the score, and from there it was mostly a back-and-forth affair with Notre Dame taking 3-6 point leads before Georgia Tech would close the gaps with a couple buckets. However, the Irish finally began to click offensively down the stretch, extending their lead to 10 with about 4 minutes to go. 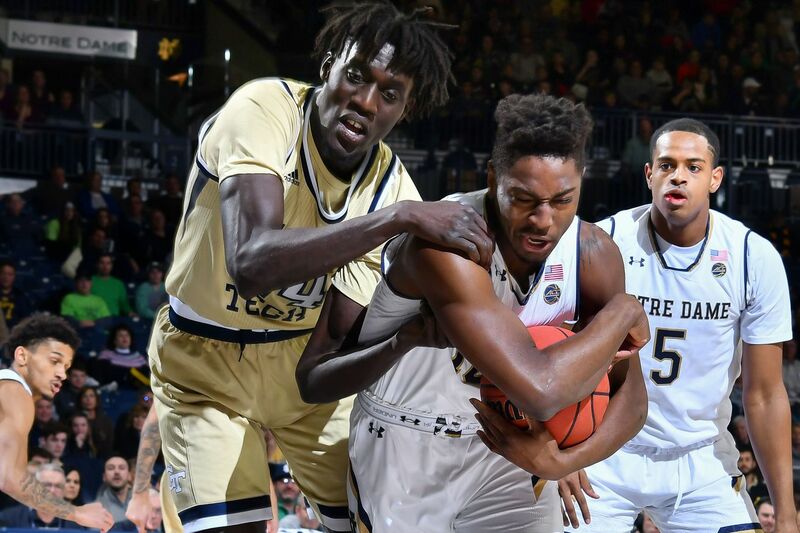 Georgia Tech tried to quickly chip away at the deficit, but ultimately just couldn’t generate enough offense to hang around, giving the Irish a 10-point victory. Notre Dame improved to 13-11 on the season and 3-8 in ACC play, and will play next at the #3 Virginia Cavaliers on Saturday at 2 PM ET.